Augustin and Judith have lived in Bryan, Texas their entire lives, but their living situation hasn't always been ideal. As a newlywed couple, they lived with Augustin's parents which provided little privacy and space. Lack of space became a more significant issue as their family grew with the addition of their two sons. But that all changed one day when they drove by a familiar part of town and noticed new homes under construction. Initially, they didn't think they could afford to buy a home, especially a new one. 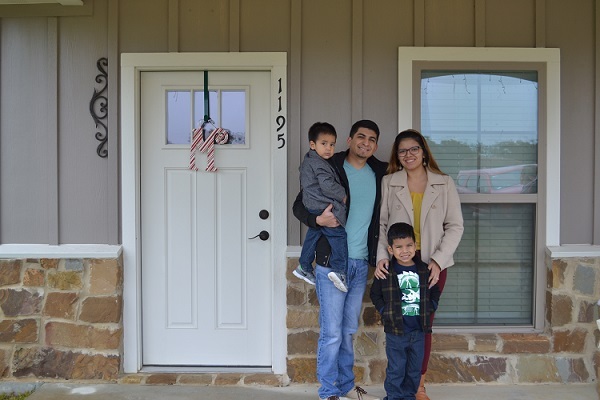 However, they quickly discovered these homes were being built by Brazos Valley Affordable Housing Corporation on land owned by TSAHC as part of our ACT program. This meant the homes would be affordable and available for families like theirs. The couple quickly jumped on the opportunity, working with Brazos Valley AHC and TSAHC on necessary paperwork and other steps in the home buying process. They moved into their home in August 2016 and couldn’t be happier. They love that the home is new, stylish and that it sits on a full acre. As an added perk, there are horses in a neighboring yard that their kids can pet. Most importantly, though, they love that they finally have a home of their own to raise their children. Click here for ACT - Veterans Initiative success stories.